I'm going to lead off with something that's kind of small and petty, but it bothers me too much to wait: Aladdin and the King of Thieves, the second direct-to-video Disney sequel ever, and the second sequel to the 1992 blockbuster Aladdin, was released in 1996 on home video, in a 4:3 aspect ratio. This makes perfect sense, given that virtually all televisions at that time had just such dimensions, and given furthermore that the movie also doubled as the finale to the Aladdin TV show, which was animated in 4:3 by the same studio making the movie. And yet, the DVD release of King of Thieves matted it to 1.85:1, and there is not, anywhere in the world, a digital version of the movie in the original aspect ratio; and while I very nearly went on a hunt to find the VHS, arranging to watch it in that format would have been a whole lot of work, and I'd have been unable to grab screenshots. So here I am, stuck with a movie in an aspect ratio that looks just terrible. I'd like to say that one gets used to it, but that's not true. So instead, we shall attempt to simply ignore it, as much as possible, and move on to the rest of the picture. 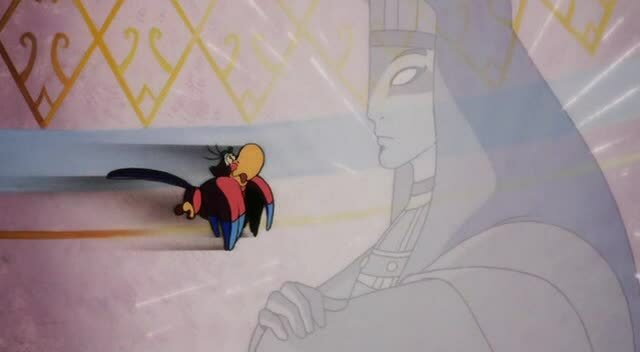 The bar for King of Thieves was not so very high as all that: all it had to do, really, was be better than The Return of Jafar, and it is thus in every single respect except for the composition of images. I'm sorry, I know I need to let it go. But some traumas, you do not soon recover from. ANYWAY, King of Thieves is an improvement over The Return of Jafar in every way that counts: story, music, performance, animation. Admittedly, it is least of all an improvement in terms of animation: in fact, there are very definite ways in which it's worse than it's fairly unlovely predecessor, in that it suffers to a greater degree from the problem endemic to work produced by Asian studios for American television audiences, that when characters speak, their mouths move to an uncertain, at best, approximation of when their lines can actually be heard, and what sounds they are forming with their lips. Blame language differences; more likely, blame the tradition in Asian animation, and Japanese animation especially (and the portion of King of Thieves animated in Asia was, indeed, done in Japan), of animating mouth movements prior to recording dialogue. Whatever the case, what is pleasantly characteristic in anime is damnable in nominally "American" cartoons, and all I mean to say is that a lot of it goes on in this picture. But if it's at best a draw in terms of the actual animation, King of Thieves is certainly a step up in terms of draftsmanship, with cleaner lines and more fully-formed expressions on the characters' faces, and best of all, some really interesting lighting effects, relative to the lower budget and resources of this sort of production. The problem evident in Return of Jafar, that for some reason none of the television animators can make Princess Jasmine look like she has a face made out of flesh and not some kind of non-Newtonian fluid, is still very much in evidence, but you can't have everything. The point stands: even if, on a raw technical level, King of Thieves is no "better" than The Return of Jafar, it still looks a heck of a lot slicker and richer, and for the general purposes of all but the most obnoxious viewer, that's enough for it to count as "better". So much - at least presently - for the look of the thing. The other key improvement is the film's narrative, with a script by Mark McCorkle and Robert Schooley that completely evades the single greatest problem that I, for one, had with the first sequel: here, the conflict isn't largely a re-tread of the same issues that cropped up in Aladdin. Not even close; except insofar as the issues raised in King of Thieves about frustrated poor people not knowing how to go about bettering themselves echo similar themes in Aladdin, suggesting in a mild but awfully sophisticated manner for what is, after all, a cheap kiddie-flick, that just because the immediate issues causing Aladdin anxiety in the first movie have been removed by his ascension to royalty, doesn't mean that the psychological state that anxiety fostered has been wiped clean. This isn't something the film goes into very much, but it goes into it slightly, and I had not expected even that. The trigger for all this is a wedding, as will happen: after a number of misadventures (87 of them), Princess Jasmine of Agrabah (Linda Larkin) and her fiancé, homeless teenager-turned-vizier Aladdin (Scott Weinger), are finally getting married. It's a time of great celebration, though it causes Aladdin to realise just how much he misses his long-lost father, dead before the young man was even old enough to know him, a concern that has not been of any apparent importance to him before now, but that's screenwriting for you. 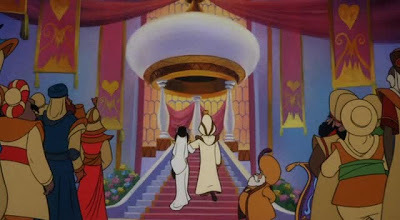 Now, among the many presents being given to the couple is a magical staff that is coveted by the King of the infamous, legendary Forty Thieves, and this mysterious figure has his army attack the wedding as a distraction for him to steal the artificact, in which he is thwarted by Aladdin; and here we all finds that the staff releases an oracle - suggesting, among other things, that McCorkle and Schooley either didn't have the slightest idea of what an "oracle" is, or assumed their target audience wouldn't - that reveals the conveniently-timed secret that Aladdin's father is in fact not dead, but is presently with the Forty Thieves, and by "presently with", we mean "is actually their King", as Aladdin learns to his dismay when he tracks them down and kills the King's untrustworthy second-in-command Sa'luk (Jerry Orbach), because having a trustworthy second-in-command would be against the spirit of the Arabian Nights. 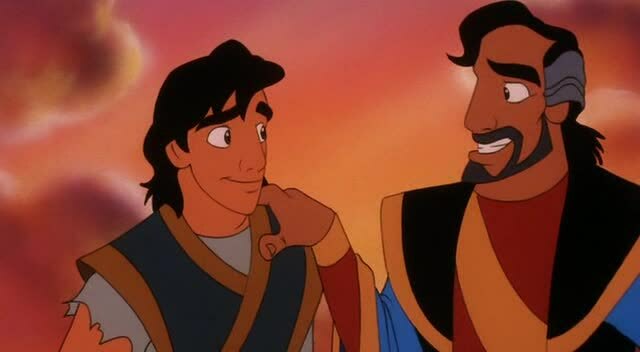 Nevertheless, Aladdin and his dad, Cassim (John Rhys-Davies), have a lovely, reunion, and the boy insists on bring the older man back to Agrabah to attend the wedding, despite the inconvenient fact that Cassim is to be killed on sight if his identity is ever found out. 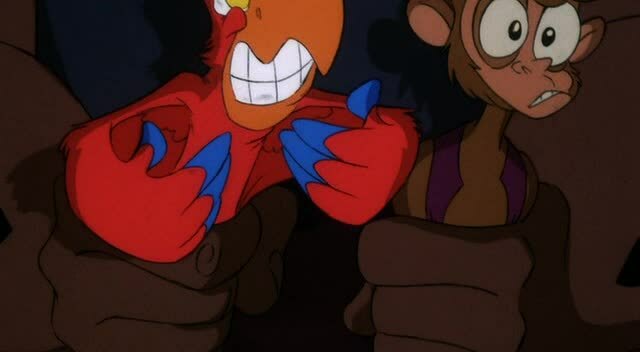 The temptation for wealth proves too much, alas, and with the prodding of the greedy anti-hero parrot Iago (Gilbert Gottfried), Cassim steals the oracle-staff, and flees. 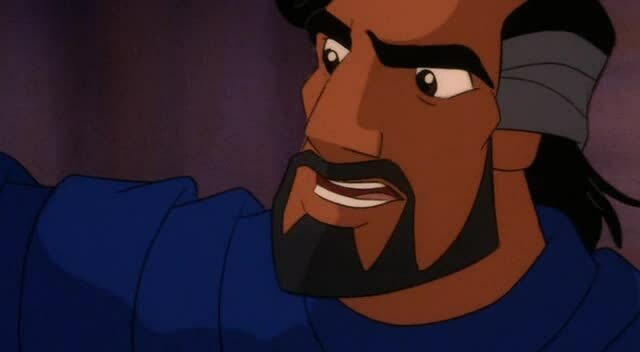 A very pissed and betrayed Aladdin is prepared to write his father off after this, but his friends and loved ones convince him to forgive, and he jogs off to the floating island where Cassim has been taken prisoner by an extremely alive and angry Sa'luk, to save the day and resolve all his daddy issues once and for all. Look, I said it solved the issue of being a beat-for-beat retread of Aladdin. I didn't say it was a sparkling, original conceit, nor a smooth and flawless narrative arc. There's a lot of traveling back and forth that goes on, particularly in the middle, and while King of Thieves, unlike The Return of Jafar, was only ever conceived to be a self-contained feature-length narrative, it still tells its story in chunks - not quite "episodic", in any sense of that word, but there's a feeling of multiple dramatic conflicts playing out one after the other, rather than one throughline. 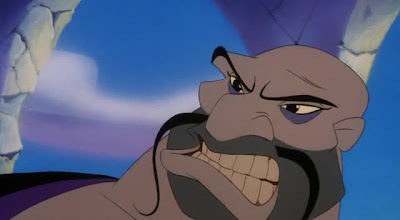 That being the case, the investigation of a whole new aspect of Aladdin's character is more interesting than yet another adventure where he has find a way through to Jasmine while fighting a sorcerer, and while the stuff of the Aladdin-Cassim relationship is stock "teach your parents well" material as is common to children's entertainment, it's spiked with enough humor and personality to rise above its generic trappings. Rhys-Davies, I think it's fair to say, is a lifesaver in this regard, giving Cassim a prickly, affectionate personality with just enough smugness that he comes across as, simultaneously, a man who could abandon his family for a life of treasure-hunting, and a man who'd still be an awfully good dad. Where Rhys-Davies's Welsh accent fits into the picture, I cannot say. The bigger problem with King of Thieves and its script, at any rate, is the padding, though calling it that isn't quite apt. 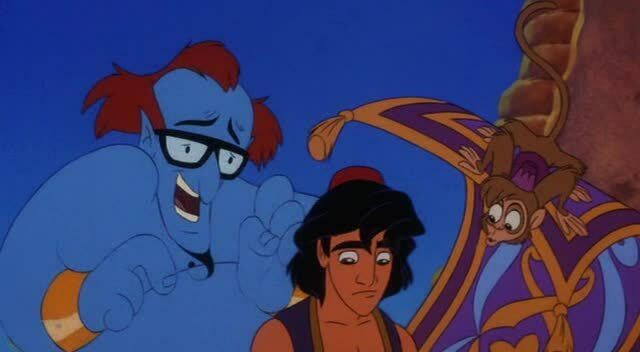 The situation was thus: the angry falling-out between Robin Williams and Disney in the wake of Aladdin was patched up in the aftermath of Jeffrey Katzenberg's departure, and with the aid of a huge pile of money, which meant that the comic took over the role of the freed genie from Dan Castellaneta, who'd voiced the character in The Return of Jafar and the TV show. And this, at least, was a good chance: all respect in the world to Castellaneta, a damned talented voice actor, but his take on the character was too much of a Williams impersonation without any of the comic energy. On the other hand, look at that plot synopsis again: you'll observe that the genie isn't even mentioned. And this is because he doesn't really do anything: set up the royal wedding, and sing a couple of songs, and have some filler moments with Jasmine while the rest of the cast is out having the plot. This is not, itself, a problem, except that Williams's performance, which as before consisted of a whole lot of riffing and not very much discipline, is considerably more scattershot and wild than in the first movie, with celebrity impersonations that exist for even less obvious reasons than before (I can't say why Williams doing a Woody Allen gag in an Aladdin film bothers me so much than Jack Nicholson or Ed Sullivan, but bother me it does). And the genie's overall lack of narrative purpose, combined with the off-the-wall ad-libbing, ends at a character whose sole function in the movie is to provide nonsensical pop culture jokes, a shocking number of which are at the expense of other canonical Disney characters; not until Shrek 2 would there be another mainstream American animated picture so dedicated to the idea that pop culture jokes are inherently funny, so we'd better have a whole fuckton of them. In Aladdin, the genie's anachronism were a disarming seasoning; in King of Thieves, they are the only point to his existence. This, to me, is a film-breaking problem. 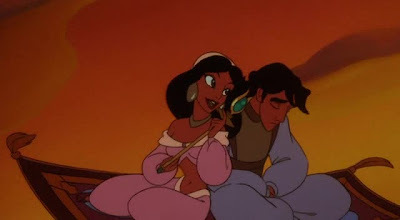 There are a few other things to mention: the score, which is largely original in place of the remix of the first film's music in The Return of Jafar, is unexpectedly beautiful and well-used, if a bit Orientalist; the songs are predominately unmemorable, but with nothing reaching the soul-scarring depths of "Forget About Love" from the last movie, it still has to count as a step up: "There's a Party Here in Agrabah", the big opening showstopper, suffers a bit from the songwriter's falling too much in love with a title phrase that, while pleasingly iambic, doesn't really want to be sung (though I am embarssingly fond of "Jasmine and Aladdin / Are gonna have a weddin'", which Williams sells more than ought to be possible), and "Welcome to the Forty Thieves", the other production number, has a lot of forced rhymes. "Out of Thin Air" is just damned peculiar, a non-love love duet that feels like spoken dialogue set to music". As the third film in a series, the movie's style is largely pre-ordained, though the anime influence on the oracle is nice; as to why Sa'luk has grey, apparently necrotic flesh, I cannot say, though it certainly makes him look more unpleasant, and given how little personality the character has as written and as performed by a sadly disengaged Orbach, he needs everything he can to land as a villain, so that's good, I suppose. Taken as a whole, King of Thieves is brutally flawed, though it rounds off the characters in a satisfying way, and is a far more deserving sequel than the flimsy, unimaginative Return of Jafar. Indeed, the parts that work are good enough that the film manages to justify giving Aladdin a sequel in the first place. Only those parts, mind you, and what the film certainly does not justify is the cottage industry it was about to jump start: while the real flowering of Disney sequels was a couple of years still in the future, it is with this film that we begin the uninterrupted flow: from 1996 until 2008, not a single calendar year went by without at least one of the damnable things getting released. Insofar as we can blame King of Thieves for this trend, it is wholly unworthy; but as the capstone to a franchise that never actually needed to be a franchise in the first place, it acquits itself tolerably well.